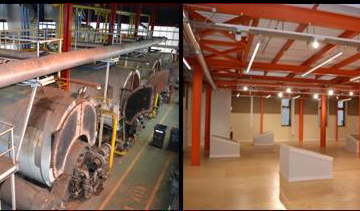 During the construction of the 3D textbook the original concrete slab and flooring of the Boiler House was retained. By retaining the concrete and steel it resulted in significant carbon savings associated with the avoidance of new material production and the diversion of unnecessary waste from landfill. The retention of the main steel structure as opposed to its replacement also resulted in significant carbon savings. The reuse of these steel and concrete structures alone resulted in the avoidance of approximately 55 tonnes of embodied carbon based purely on production impacts and not considering the impact of transport or disposal. This is comparable to the sequestering capacity of 5000 trees over 20 years.